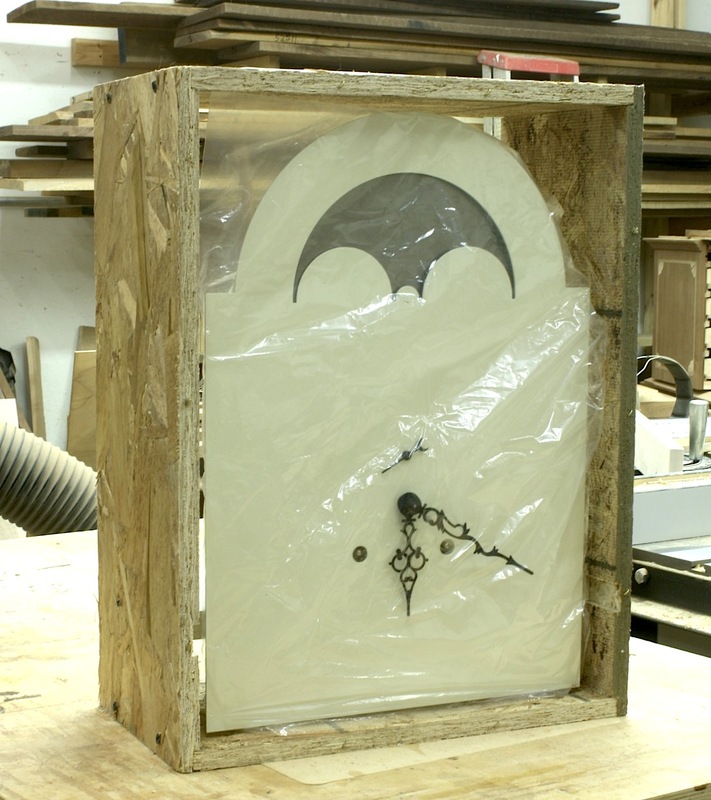 This past week, the movement for my Egerton Tall clock arrived from Green Lake Clock Company. 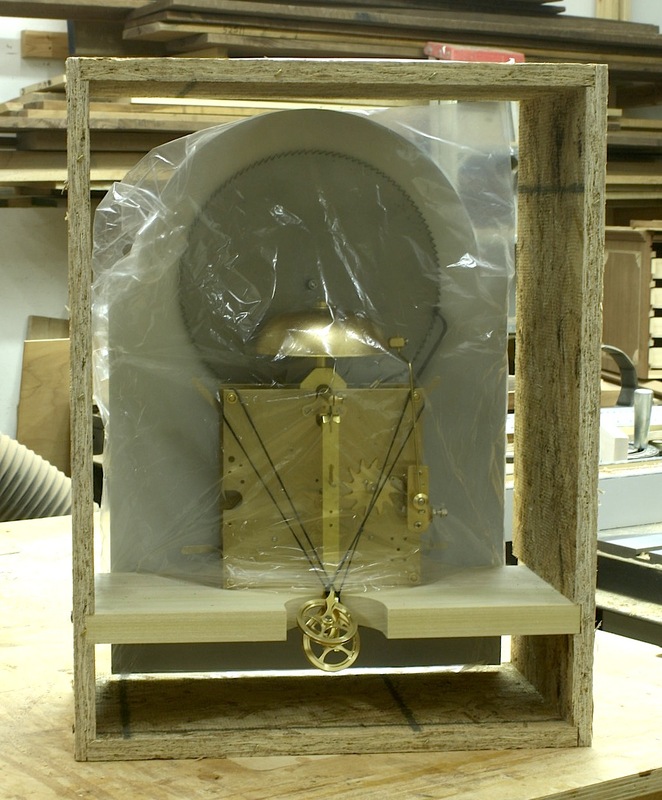 Because many woodworkers do not often order clock movements, I thought it would be interesting to see photos of not only the movement and what comes in the package, but also get a look at the crate in which everything is packed. 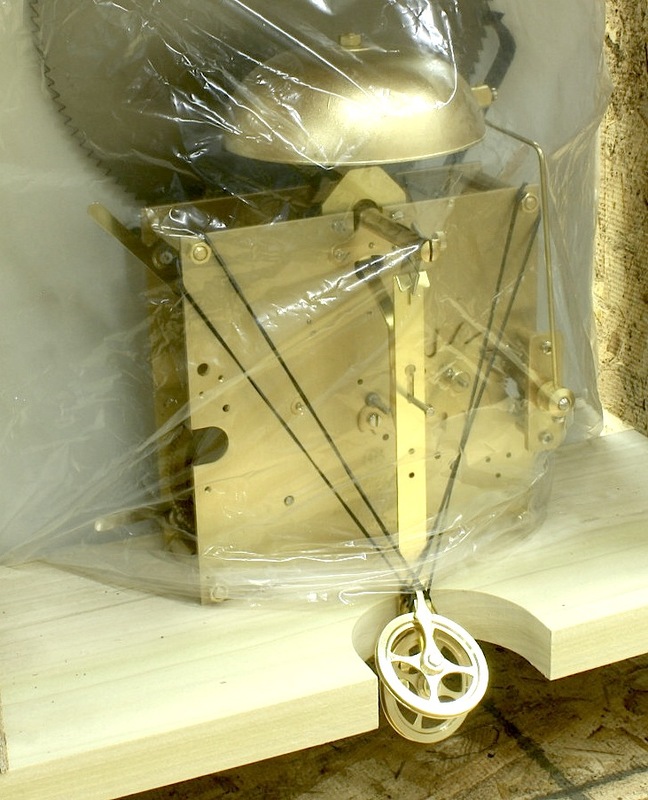 The movement itself – shown in the photo to the right – is a Kieninger Bell Strike movement which includes the top-mounted bell, cable pulleys and the gears and internal workings which are behind the back plate. 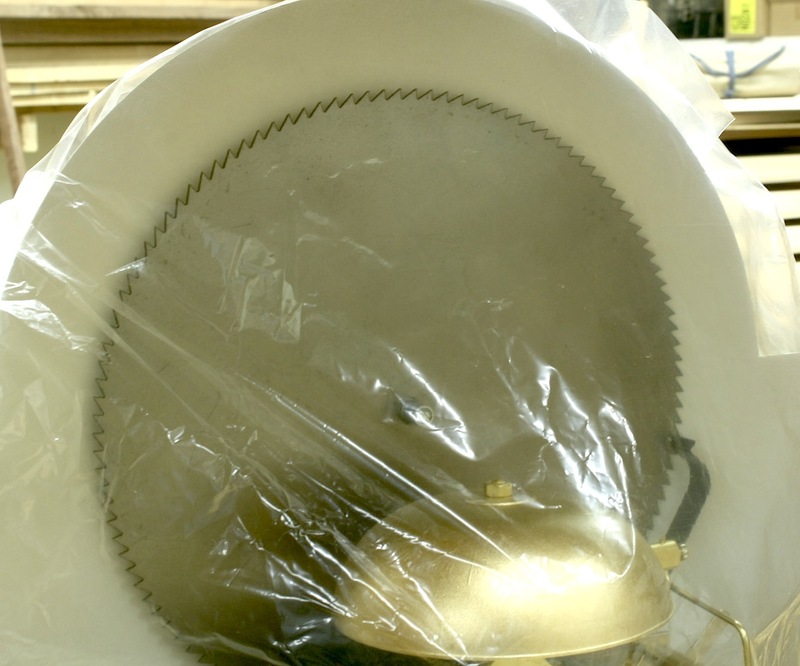 The saw-like wheel that you see above the bell is the moon dial. A moon dial rotates slowly as the clock moves throughout the day. Different scenes are painted on the moon dial to reflect the time of month. This, along with the main dial can be customized for a personal effect. A clock that was built by the customer to which my tall clock goes, has an image of his house painted on the moon dial. Very cool. 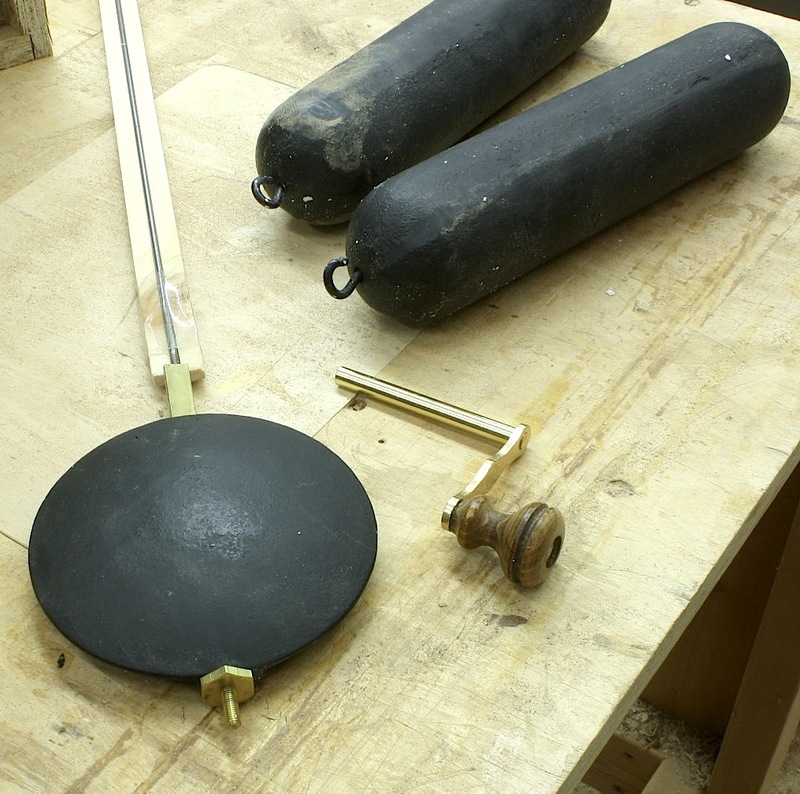 Other parts of the movement – sent packed in three layers of Styrofoam – are the weights and pendulum bob which are cast iron, and a winder and a few miscellaneous parts. These are shown to the left. Also included with the package are clock hands. Below are a couple more photos. The left-hand photo is a close-up view of the movement, and at the right is a close-up view of the rear of the moon dial. Overall, the entire package is ready to install into the clock. Now if I just had the clock ready for the movement. And kudos to Green Lake for how the movement was packaged for shipment. Below you can see a corner of the crate. 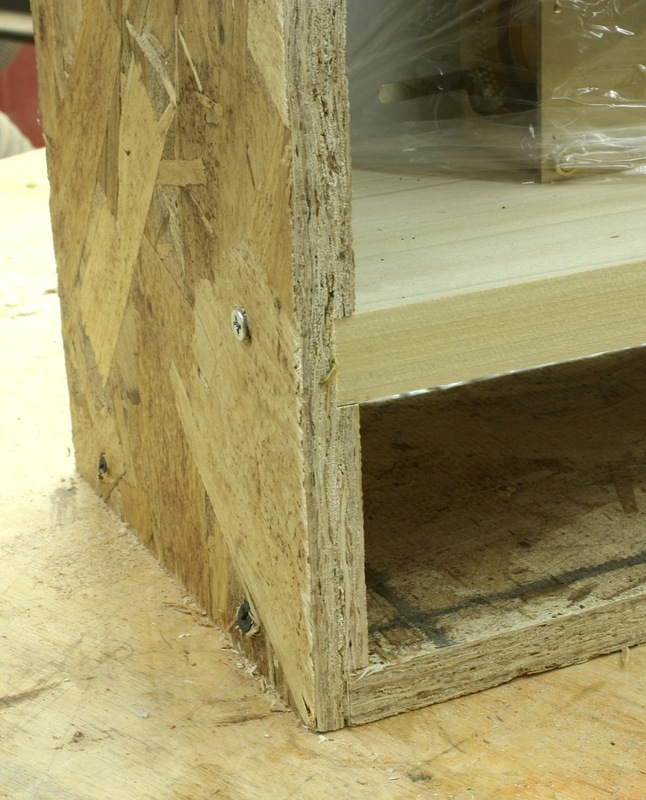 Notice the rabbeted sides that capture the top and bottom of the crate. And look at the dado for the mounting board. Nice, quality work. I am impressed. You can reach Green Lake Clock Company through the highlighted link above, you can call Mike Siemsen – company owner and instructor at the 2013 Woodworking in America conference (WIA), (read more about WIA here) – at 651-257-9166 or send snail mail to: 9912 Green Lake Trail, Chisago City, MN 55013. Oh, you can email him at mike@greenlakeclock.com.